If you are new to time-trialling you may find the following answers to frequently asked questions helpful. You can do a time-trial on any type of bike as long as it is in good working order and it is road-worthy. Road bikes and TT-specific bikes are designed to go faster than hybrids and MTBs but it is perfectly acceptable to take part on any bike. Don't be put off because you think your bike might not be fast enough as it does not make any difference to anyone else what type of bike you ride. Do I need any other special equipment? No, a straightforward bike is all that is needed to join in and take part. People who regularly do time-trials often buy tri-bars to bolt on to their handlebars to get an ‘aero’ position, but these are not by any means a requirement. You need to be sure you can comfortably complete the distance, but other than that your fitness level is not a hindrance to taking part. The whole point of a time-trial is that everyone is individually timed against the clock. If you are slower than other riders it makes no difference to their race and you will still record a time and you can make it your personal challenge to improve upon this. Everyone has to start somewhere and the vast majority of experienced time-triallists will understand the position of a novice and will give nothing but encouragement, advice and support. Club Events: Normally yes, unless it is a 'come and try it' event and designated as such. You should check this with the local cycling club. 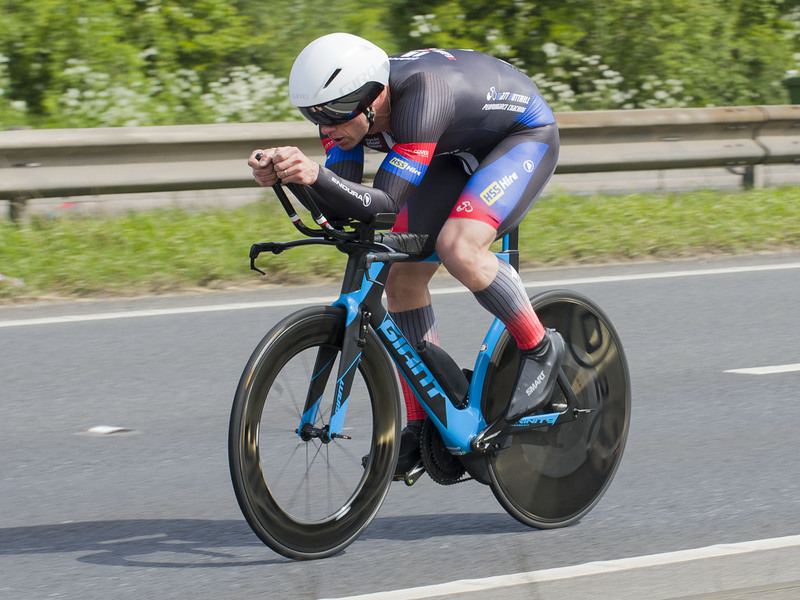 Open Events: If you are not a member of a cycling club which is affiliated to Cycling Time Trials then unfortunately you cannot ride an open event. All VTTA regional groups are affiliated as clubs to the CTT so all VTTA members can ride any open event. There are some different arrangements in Scotland for events organised by Scottish Cycling. See here for details. Club Events: The entry fee is usually a small charge of approximately £3-£5, paid on the day to the club officials when you sign-on and collect your race number. Open Events: The entry fee for open events is usually around £8-£10. You will find this shown for the event on the CTT website or in the handbook. Club Events: Arrive at the meeting point with plenty of time to spare before the race. Most riders allow a minimum of half an hour before the event start time. This means you can sign-on, prepare your bike and yourself, pin on your number and get warmed up without rushing. Open Events: Prior to an open event you will have received a start sheet giving your start time. The only requirement is that you are ready to start, at the start line at the allotted time. In practice this usually means that riders aim to reach the HQ about an hour before their start time, to collect their number, sign on and get warmed up without rushing. Club Events: Club events are informal racing events that are run very cheaply to provide lots of racing opportunities for club cyclists. There may therefore be no HQ with toilets and changing facilities. Most competitors travel to the event in cycling kit, get changed in their car or find a discreet way to change behind a hedge. Open Events: Open events have a higher budget than club events and nearly always have a HQ at a village hall or similar where there is space to change and toilet facilities. You can expect a result board at the HQ, with refreshments served afterwards. Open Events: As for club events except that refreshments are always provided after the event. You usually get a free cup of tea in exchange for returning your race number. Club events: When you sign on make sure you know what your start time is and exactly where is the start line. No one will remind you of this or worry about getting you to the start on time. You should make sure you are on the start line at least a minute before your start time. When it is your turn, the timekeeper will call your number and you can move up to the start line and wait for the timekeeper to count you down. Open Events: As all riders must pre-enter an Open Event, the start order is published in advance and you will receive this in the post a few days before the event. This tells you your exact start time. On the day you will need to collect your number from the HQ and present yourself at the start line at least a minute before your start time. Yes, it is quite common for cyclists to ride out to events. At club events one of the officials will usually be willing to let competitors leave a few valuables or clothes in their car during the race. At open events you can leave kit or clothing (but probably not valuables) at the HQ. Is the traffic on the roads likely to be heavy? 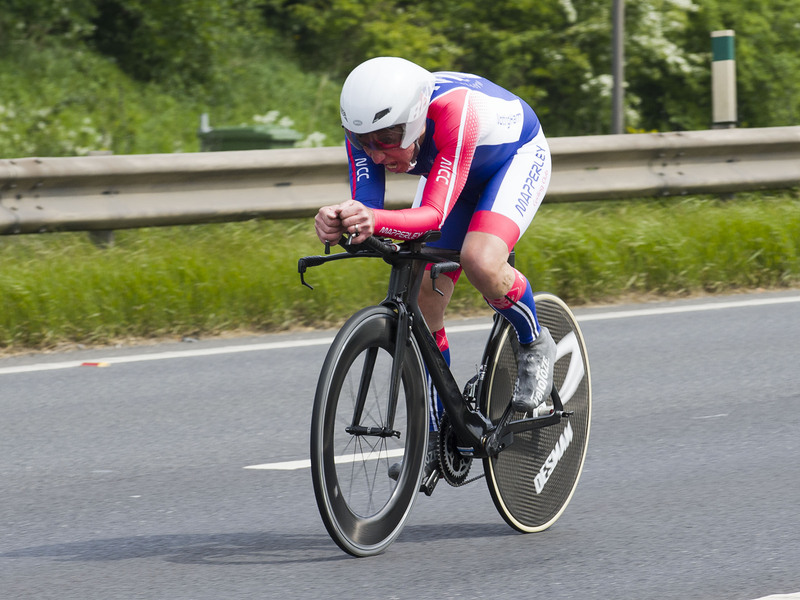 The safety of riders is carefully considered when deciding whether a course is used for a time trial. Some events do involve riding on dual-carriageways but the traffic is expected to be relatively light. Some of the events are entirely on single-carriageway roads. If you are particularly concerned about this, please look at the course descriptions carefully before selecting an event. The CTT does have some rules about what can be worn in open time-trials – probably rather out of date but you should be aware that you could be prevented from starting unless your clothing complies. Basically, ordinary cycling shorts to mid-thigh, and an ordinary cycling jersey with sleeves (or any other clothing which covers the body in the same way) are acceptable. Bare-shouldered cycling attire which is the current fashion for triathletes is not, unfortunately, allowed. Also, you should not wear clothing showing commercial sponsorship unless your club is a sponsored club. Clothing rules are more relaxed for club events. Where can I get details of the exact route? There is no obligation for adults taking part in time-trials to wear a helmet although you are strongly advised to do so. Will there be marshalls to direct me? The onus is on the rider to know the course, so you should make sure that you know where the course goes before starting the race! But there will normally be marshalls on the course to indicate the correct route. NOTE: marshalls are not there to direct or stop traffic (that's illegal) or to tell you whether it's safe to proceed (that's for you to decide). Of course anyone can have a puncture anywhere and it may happen to you during a race. If so, it is incumbent on you to arrange a rescue or to replace the inner tube or mend the puncture yourself. Whereas most organisers will not leave you stranded on a remote road, you should not assume someone will rescue you. Time-triallists therefore often carry a pump, inner tube and tyre levers when they race. An alternative solution is to agree with a friend to mutually come to each other’s rescue should the need arise. Don’t worry if you are overtaken – this happens to everyone at some point or other and there are always going to be stronger riders taking part. Just let the overtaking rider get well ahead of you so that you get no ‘drafting’ advantage and don’t be put off. Concentrate on riding your own race at your own pace. This, after all, is what time-trialling is all about! When you pass the timekeeper at the finish line it is traditional to shout out your number in case your number is not easily visible to the timekeeper. Continue down the road, riding gently to warm down. Don’t distract the timekeeper as they have an important job to do. Club Events: After crossing the finish line, continue riding and cool down and return to the meeting point. Do not go and distract the time-keeper. After all riders have finished the timekeeper will come back to the meeting point and let everyone know their time. Open Events: At open events the results are displayed back at the HQ on a result board. You will also receive a formal results sheet in the post a few weeks after the event, including any prize money you may have won. Occasionally at open events a prize presentation is made at the HQ after the event.